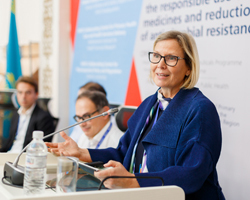 Experts called for the responsible use of medicines and the reduction of antimicrobial resistance (AMR) during a consultation held in Almaty, Kazakhstan, from 30 October to 1 November 2018. Focusing on the role of primary health care in this area, the event gathered participants from 15 countries. They included managers involved in primary health-care reforms, officers in charge of pharmaceuticals and promoting the responsible use of medicines, experts on medicine safety, and other professionals who are currently or potentially could be promoting prescription-only dispensing of antibiotics. AMR is a global health challenge mainly driven by the overuse of antibiotics, uncontrolled over-the-counter sales and self-prescription. AMR complicates the treatment of infections, jeopardizes the ability to perform complex medical interventions, and may lead to longer hospital stays and increased mortality. The recently adopted Declaration of Astana calls for continuous, comprehensive, coordinated, community-oriented and people-centred primary health care with appropriately prioritized disease prevention and health promotion. Yet primary health care is not always viewed and supported as a key area in the response to AMR in health systems. One of the aims of the cross-programmatic consultation in Almaty was to emphasize and explore its crucial role in tackling AMR. Most antimicrobial medicines are consumed in community and outpatient settings – that is, outside hospitals. About 90% of all antibiotic prescriptions are issued by general practitioners in primary health care. For this reason, only an approach rooted in communities and focused on engaging patients, parents, and public and professional associations can succeed in improving the responsible use of antibiotics. the promotion of delayed antibiotic prescribing strategies. Alongside these measures, the communication skills of general practitioners and nurses as well as public awareness campaigns should also be developed. Experts highlighted the need to keep working on aligning clinical guidelines and protocols with essential medicines lists; developing a closely monitored procurement and production system; and building the competencies of prescribers. Tackling AMR requires a whole-of-government approach and investments that will yield returns many years from now. It also requires a focus on the many causes and drivers of AMR that lie outside the health sector. For example, antimicrobials are widely used to treat livestock. The European Union recently approved restrictions on the use of antibiotics for healthy farm animals starting in 2022. The health technologies and pharmaceuticals programme and the health services delivery programme of WHO/Europe’s Division of Health Systems and Public Health jointly organized the meeting in Almaty. The WHO European Centre for Primary Health Care hosted the event.